Lazily shake everything except one sprig of mint with ice cubes. Strain onto new ice cubes in a glass. Garnish with the third sprig of mint. So far a Whiskey Smash is my favorite version of this drink. The whiskey just melds with the mint like Fred Astaire and Ginger Rogers (or Hennessey Paradis and your lips...). This is the last Smash recipe listed in The Bartender's Guide but I think it's also the best (brandy was king back then so the Brandy Smash was listed first). This beverage is simply a julep on a small plan. That about sums it up. They were stirring them back then but I like the simple shake and strain for mine. I am using rye whiskey in mine but bourbon is perfectly suitable as well. 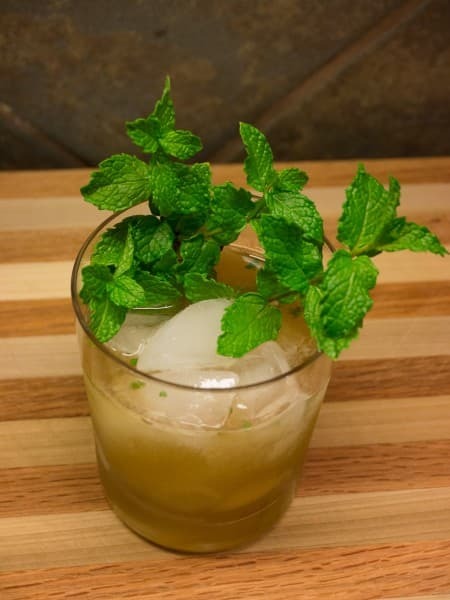 I used my true spearmint - Mentha spicata - for this drink. My spicata is growing slower than my Kentucky Colonel mint so I used the Colonel for my brandy and gin smashes. I have to say that the spicata is sweeter and more mellow than the Colonel which has a more vegetal quality (think French absinthe vs Czech). If you are shopping at the garden store for spearmint, look to see that the plant label says Mentha spicata on it and dispense with the other variations of mint you find.